Jessica Shiekman intended to get a "kalicious" smoothie at her local Whole Foods store. 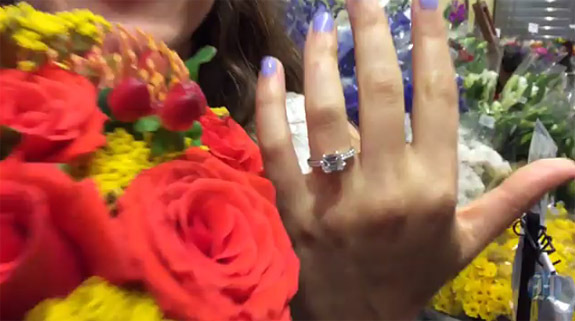 What she ended up getting was engaged. 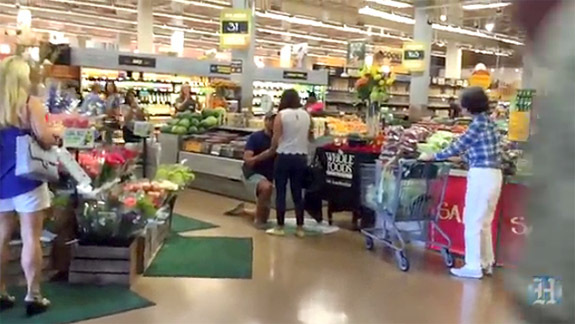 The produce-aisle marriage proposal, which was expertly staged by her boyfriend, Aaron Califf, was witnessed by family, friends, shoppers and reporters from the local media. Shiekman and her sister had been on their way to the mall on Saturday when her sister insisted that they make a quick stop at the Whole Foods in Ft. Lauderdale for a kalicious — a healthful blend of kale, spinach, banana, lemon and apple juice. But, the women never got to the smoothie station. Instead, Shiekman was greeted at the top of the produce aisle by her boyfriend of seven years, Califf, who was decked out in a very official grey Whole Foods apron and cap — even though he doesn't work for the store. The stunned girlfriend followed Califf back to his rose-petal covered demonstration table near the organic grapes and raspberries. 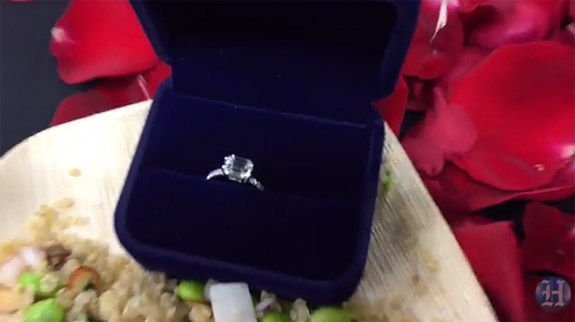 There, she saw a ring box waiting on a plate of quinoa salad. A yellow and red, hand-rendered sign on the front of the display read, "Truly Special / Jessica & Aaron / Together 365." At that point, Califf grabbed the ring box, went down on one knee and asked Shiekman if she would spend the rest of her life with him. She said, "Yes." The young man nervously fiddled with the beautiful emerald-cut diamond ring. "Which hand does this go on?" Califf asked. When his girlfriend clarified it should go on her left hand, he attempted to put the ring on her index finger instead of her ring finger. Nevertheless, the ring finally made it to the correct finger and the couple embraced. 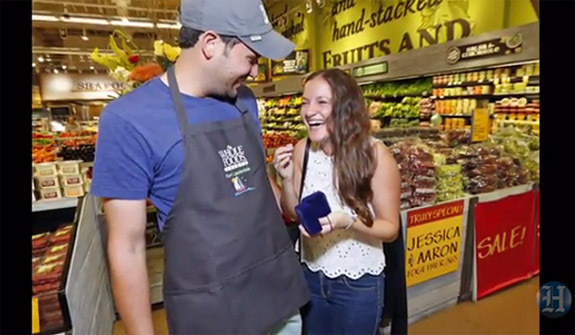 Califf, 26, who is working on his MBA and manages dental offices, arranged with the store's marketing and public relations departments to allow him to pose as a clerk to make the surprise extra special. As Califf told WSVN, "This is Jessica's self-proclaimed happy place." 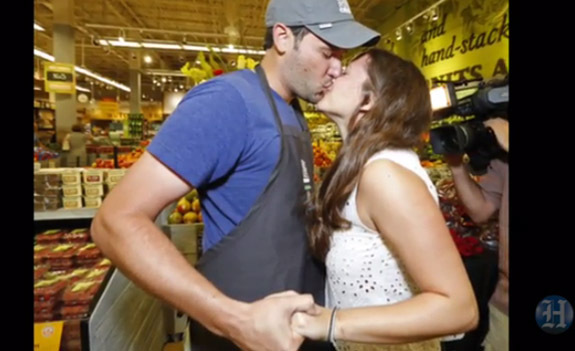 "I wanted to catch her off guard, so I picked a grocery store," he said. The clever fiancé had also enlisted the help of Shiekman's mother, sister and several other family members. Califf's family had flown in from Chicago to be part of the exciting day. Shiekman, a 27-year-old family therapist, told the Miami Herald that she thought her boyfriend looked "very handsome" in his Whole Foods attire. Credit: Video captures via miamiherald.com and WSVN.com.